Bee farming business not only raises bees but collects and gather honey, sell bees, royal jelly, bees’ wax, propolis, pollen, bee venom, and other bee products. Although the most beekeepers maintain hives for honey, bees also produce other useful products. And the collected Beeswax from cell caps and old combs are usually used for high-quality candles, pharmaceuticals, and lotions along with friction-reducing waxes for skis and surfboards. Moreover, several other bee products are sources of food for humans in addition to honey. Also, as a form of meat in many non-European countries, bee brood (young bees that are housed in the brood comb of a hive) is consumed. And when bees produce food for their larvae, food additives for humans and domestic animals are made from bee-collected pollen and from royal jelly. In the aspects of Bangladesh, honey is produced by two ways. One is naturally that’s not by culture, but another one is cultured in a certain type of wooden box by apiculture Apis cerana and Apis mellifera. The main areas of natural honey production in Bangladesh are the Sundarban, Hilly areas, and Madhupur. As Sundarban is one of the most leading honey production areas in Bangladesh, about 75%natural honey is produced in Sundarban forest area by Giant bees Apis dorsata. The good news is that the Bangladesh government and many NGOs have taken various schemes to provide technical support such as training, marketing facilities, and supply of necessary equipment for beekeeping to increase the production of honey in the country. Besides, because they not only produce honey and beeswax but also act as primary pollinating agents of many agricultural and horticultural crops, honeybees are of great economic importance. It’s a source of income of the rural people as a cottage industry. Apart from these, there are good chances to earn a lot of foreign currencies by exporting through scientifically procured and bottled honey. That’s why this sector has a bright prospect in the future. It’s the maintenance of honey bee colonies when you’re in bee farming business. And it’s commonly in man-made hives, which is made by humans. In order to collect honey and other products that the hive produces, a beekeeper or apiarist keeps bees. Also, bee farming has got a new method at this time while using bee boxes that are gaining huge popularity among a section of young farmers in our country. 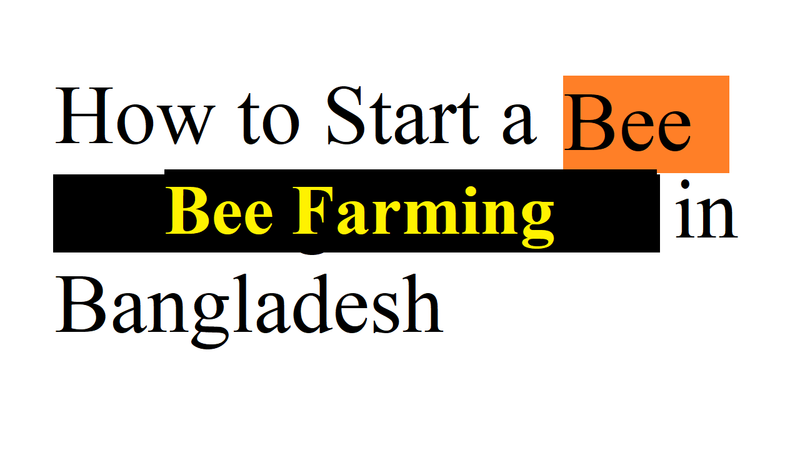 Now, let’s know how to start a bee farming business in Bangladesh. It’ essential while starting a bee farming business to learn how to start a bee farm begins by understanding what beekeeping is and what it does. This is a way of generating honey for consumption, for wax and other bee products when you’re in this business. On the other hand, they can also be sold or made into useful items. For these all purposes, a business plan should be made, which should be very simple and detailed. Along with explaining what you’re going to need for your business, and how to start your own colony, the business plan should be able to discuss the role of the beekeeper. Just about anywhere, yes we mean it anywhere that you can keep beehives. For example, it can be either the countryside, in the city, in a corner of the garden, by the back door, in a field, on the terrace, or even on an urban rooftop. As bees happily travel for miles to forage for what they need, you don’t need a great deal of space or flowers on your property. Although bees are amazingly adaptable, you’ll get optimum results and a more rewarding honey harvest if you follow some basic guidelines. As it provides some protection from the elements, the growth near the hive would provide some nearby pollen. And as long as the sun is shining, the bees will stay active. It bases on the bees and the products they produce for the supply chain of a bee farm. As it can fetch you an outstanding income, bees are known to produce many marketable products. You surely need bees to serve as the foundation of your supply chain when starting a bee farm. Whether a bee farm might be for businesses or as a hobby, it’s a lucrative means of income either way. But, you can’t find enough buyers and consumers until you make a good network with people in this field.